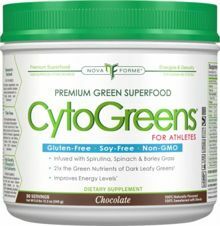 Mix or blend 1 scoop of CytoGREENS™ with 1 cup (8 oz, 240 ml) of cold water. Take 1 to 2 servings daily. This product has a tamper evident neckband for your protection. Do not use if neckband is missing or broken. Not recommended for children, pregnant or lactating women. If you are taking prescription medication or have a pre-existing medical condition, consult your health care practitioner before taking this product. Store in a cool, dry place. Product sold by weight, not volume. 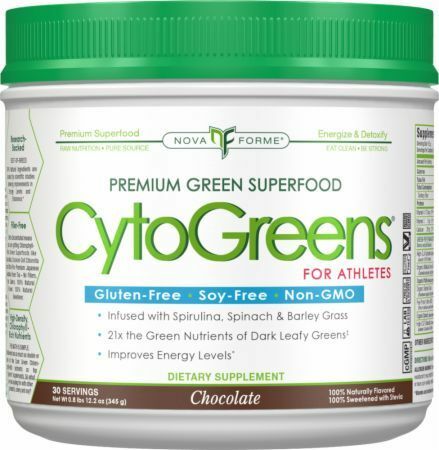 Cocoa Powder, Natural Flavors, Organic Guar Gum, Xanthan Gum, Salt, Stevia (95% leaf extract). ALLERGEN WARNING: Produced in a facility that handles Milk, Egg, Soy, Peanut, Tree Nuts, Fish Oil, and Shellfish products. With Patented ARX Athletic Recovery X-Celerator - backed by two human clinical studies. Suggested to support Endurance and Recovery. * Included at 500 mg Serving.